Today in Masonic History Arthur Robinson Gould is born 1857. Arthur Robinson Gould was an American politician and businessman. Gould was born on March 16th, 1857 in Corinth, Maine. He attended the local common schools and East Corinth Academy. Gould moved to Bangor, Maine where he opened a candy factory. In 1887 he moved to Presque Isle, Maine. There he engaged in the lumber business, built electric power plants and built an electric railroad. 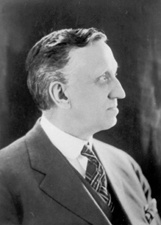 From 1902 until 1945 he was the president of Aroostook Valley Railroad. From 1921 to 1922 Gould served in the Maine Senate. In 1926, Gould won a special election to fill the United States Senate seat of Bert Fernald who had passed away. The election was important not only in Maine, it had ramifications across the country. In Maine at the time the Klu Klux Klan (KKK) had a strangle hold on Maine politics. On the side of the KKK was the current sitting Governor who, like Gould, was a Republican. Gould ran on an anti-Klan platform after recieveing the Republican nominaton. It put the Governor of Maine in the position to denounce his own party's nominee. After Gould won the United States Senate seat the head of the Republican State Committee hailed Gould's vicotry stating "the sinister influence of an oath-bound organization no longer threatens the welfare of Maine." Across the country Gould's election was significant becuase the United States Senate was split down the middle 47-47 along party lines. A Democratic Senator from Montana tried to block Gould from taking his seat claiming that Gould had bribed the Premier of New Brunswick to gain favorable position for Saint John Valley and Quebec Railway, in which Gould was a major investor. The bill to block Gould from being seated was defeated and later a Congressional investigation determined that Gould did nothing wrong. Gould was also an anti-Prohibition Republican. Maine had prohibition long before it was passed in the United States. In an article that published before he was in the Senate, Gould had stated that he fermented fruit juice in his home for private consumption. This outraged the Prohibitionist arm of the Republican party and they threatened to prevent his renomination. Gould stated that he did not plan to seek a full term of his own, although he never mentioned the Prohibitionist threats. He did state that "the fact of the matter is that I'm not cut out for politics, I want to get back to my railroad and the pine forests of Maine." Gould passed away on July 24th, 1946. Gould was a member of Trinity Lodge No. 130 in Plesque Isle, Maine. He was also a member of Garfield Chapter No. 48 Royal Arch Masons in Caribou, Maine, St. Croix Council No. 11 Royal and Select Masons in Calais, Maine and St. Aldermar Commandery No. 17 Knights Templar in Houlton, Maine. He would leave St. Croix Council to became a charter member of Aroostock Council No. 16 in Presque, Maine. There is information that Gould demitted from various masonic organizations, including Trinity Lodge prior to his passing. Although it appears that he was a member of the Ancient Arabic Order of the Noble Mystic Shrine first in Kora Shrine Temple then in Anah Temple up until the time of his passing.